మీకూ మీ కుటుంబ సభ్యులకు జయ నామ సంవత్సర ఉగాది శుభాకాంక్షలు. VISAKHAPATNAM: With general elections around the corner, it is not just political pundits that have their hands full number-crunching to figure out the political permutations and combinations. Astrologers too are busy stargazing to predict the future of political parties and leaders in the fray. V Kamalakara Rao,TNN | Mar 23, 2014, 01.47 AM IST. Even as the astrological alignment of stars predicts a bright future for YSRCP and TRS, the future is glum for parties like Congress and TDP, predicted astrologers. 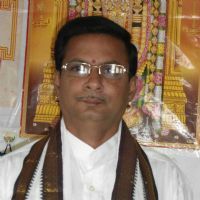 Astrologer PV Radhakrishna from Sri Medha Dakshinamurthy Jyothishalayam said that because of Sani Mahadasa, Congress would not be able to win the elections in the state and would see good times only after 2017. Thanks for visiting my profile page.........! పంతుల వెంకట రాధాకృష్ణ అను నేను మరియు నా సతీమణి పరాక్రిజయ అను పేరిట రచనలు చేయుచున్నాము. ఇప్పటికి బాలల రామాయణము, సుధారామం, అమ్మకు అక్షరాంజలి అను మూడు పుస్తకములు ఆవిష్కృతమైనవి. మరియు ఇరువురము జ్యోతిష్య ప్రవృత్తిలో ఉన్నాము. అపార్ట్ మెంట్స్ కి వాస్తు వర్తిస్తుందా? Login to Start connecting with PANTULA and over a Million other Telugu people world-wide!